I knew I wanted to develop some sort of greenman in leather, either tooled or in a mask - but when I saw an image of the Greenman at Bamberg Cathedral I knew exactly what it had to be. The true color is a waxy medium green with mild copper accents, but I'd also like to paint one for each of the seasons. Leather and acrylic. It is such a nice design. Amazing! Stunning ! The Green Man is one of my favorite symbolic images, and this mask embodies it so wonderfully! I love the copper accents too, nice touch. Many thanks! I'm quite fond of greenmen - I've got several more concepts for them lined up, if I ever find time - but these versions in which the features consist of foliage, rather than the somewhat more classic faces spewing leaves. The copper was a lot of fun to apply (I have a minor addiction to copper paint) and lent the mask more depth. Thanks again for your comments! Yeah, I like this take on the image The classic image is all well and good in its own right too, but this still captures the essence of it well. And you're very welcome! Gorgeous! I've always wanted to make leather masks. Very inspiring. Sorry to take so long in reply - it's been a very long year. Thanks very much for your interest! I love masks and I love the themes of the Green man and the goddess, your work is astounding. Thanks very much! I was hoping to get the right sort of neutral face on this one and still convey something of the dignity of the subject matter. Glad you liked it! This one remains a firm favourite of mine - it's truly elegant and very nicely designed. P.S. I know you're horribly busy and don't expect you to reply. Thanks! I love this guy; I've got a few more greenmen in the works, and yet this one is distinct, with such a gentle style. He seems more and more a friendly figure, though, more approachable, as time goes on; maybe I'm acclimating to seeing him all the time? Thanks a lot, again, I can't wait to get around to some true and proper feedback on your new (and newly-submitted) work! I must confess my curiosity; is it for sale? Most terribly sorry to reply so late - real life keeps intruding on my maskmaking and participation in galleries. I'm flattered by your compliments; it's wonderful hearing what others think of my work, particularly the difficult pieces like this. As for sales - this original was a gift, but I can duplicate the design (and have before) if you are interested; drop me a note here at dA if so. Thanks again, for your kind words and your interest, and the best to you! I didn't know it was possible to bring in details like that in leather. Really amazing work. Very nice shape and beautiful colors. Very well thought out, and outstanding craftwork. Haha that's quite humoristic. No problem about the delay in your responce though. I just like to look around on deviantart and give some feedback. I'm used to not receiving a responce half of the time, and with the amount of works I comment on I can't even keep track of whether or not they reply. Sorry for the late reply! I'd recommend ~Ranasp's tutorial here - it's the most comprehensive I've seen on the web anywhere. But you're right; there's a real lack of materials on leather sculpting on the internet, and in books besides; everything I know is self-taught by experimentation. Hope things worked out for you! I love this. So much. And if I wasn't SO wiped out, I'd wax eloquent on why I love it so. But I'll just have to leave it with... I really really really love this. This is featured in my journal today. Wow, this is gorgeous! Great masks. Great talent. Your mask work is incredible. So clean and crisp. This is very nice! I love the realism of the leaves, and how elegantly they form into a mask shape. BEautiful work. Archaic's a good thing in my book - thank you very much! It's modeled very loosely on a cathedral carving I'd seen a photo of - the acanthus-leaf shapes are probably what give you that impression about it, as it's a plant they used in a lot of old carvings and engravings. I think I'll comission you sometime in the future. Your masks are so cool and unique, I just love how you do them. I would do it now, but I have to save money to buy copyright for my first book before I publish it. Ooh! Congratulations, I'd never be able to write a book! I hope it all goes well - there are occasionally some really good articles on first-time publishing in Ellen Million's Zine if that's any help (if you hurry and read it before it changes to the new issue at the beginning of February, they had a lot of writers' articles for January). Good luck! My commission status is pretty much always open just so long as you're not in a hurry - the more important a deadline you've got, the more notice it's better I'd have - but I'm always up for custom work. Send me a note sometime when you're ready, whether or not you know what you want; I'm happy to brainstorm and put together some designs, and don't forget to tell me how the book's doing - that's really exciting! Thanks a lot for the compliments - your feedback's helpful! I'll check that out, and I'll send you a note when I've got some money. I'll be sure to keep you updated about my book, I usually keep updates in my journal. You could write a book, you just have to have patience and ideas . . . But patience is always more important. If you don't have the patience, there's no way anybody will ever be able to write a book. 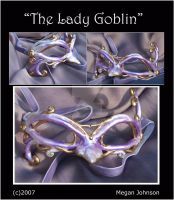 I'm looking forward to working with you - I love it when I get to make a mask specifically for a particular person. One-size/style/color-suits-all is not my favorite way to do things. Me too . . . I'll get a few more dollars and note you. I only have twenty-something right now, and I don't think that's enough for all the work you go through. Well, I've sent you a note already, likely in no small part because I'm avoiding doing the data-analysis assignment I've got hanging over my head ^-^ Forgive me. And I cannot thank you enough for understanding that someone's personal art is not the equivalent of a mass-produced piece of spray-painted vaccuformed thin plastic from a sweatshop manufacturing plant. People have gotten so used to purchasing prefabricated commodities that they forget that the art they admire at a gallery, show, or fair is not produced in the same way and valued equivalently. You're exactly the sort of person that any artist hopes to come by: one who can appreciate the work of hands. This mask is really awesome! I love Venice, and it looks a bit like a mask from Venice. Thanks! I'd love to see Venice, particularly for the masks... The design's a little similar to the Foglio masks, partly because of the theme, partly just due to coincidence. That is just amazing. I think this is my favorite of what I've seen in your gallery.